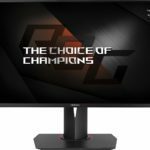 I am not big on writing reviews but the exceptional experience I had recently convinced me that the ASUS ROG SWIFT PG348Q review was something I needed to do. I mean I rely on the suggestions of other reviews when making up my mind about a purchase, then it’s only more than courteous to return the favor by sharing my take on a product I have come to love. Let’s get started. At 34” this is a seriously large monitor. There’s just no complaining in the size department because this is as close to perfect as it gets. 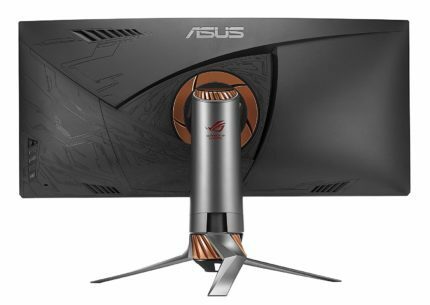 ASUS claims that ROG SWIFT PG348Q PC monitor has the curve that you have been waiting for. Well, I have to totally agree with the company’s claims. Whether I am relaxing on the couch binge watching Netflix or I’m fully enthralled playing Rise of the Tomb Raider, I get the best viewing angle along with excellent color quality. Thanks to Nvidia G-Sync technology, there is no screen tearing, input lag or display stutter. I get the most seamless visuals while playing Fallout 4, Hitman and other favorite games. The game visual technology is so advanced that I can choose amongst 6 different visual modes and pick the best one for my purposes at any given moment. What’s even better is that these settings can be accessed through both the joystick and the on-screen display menu. I love the ultra-wide IPS panel that allows viewing at wide angles with minimal color shift and distortion. The visuals experienced through this 34-inch gaming monitor are immersive and beautiful. At 109 pixels per inch (PPI) pixel density, you can expect to have the most incredible gaming experience. My partner and I become fully captivated while racing each other on the monitor in Dirt 3 – this monitor is really as close as it gets to doing things in real life. The experience of watching movies has been equally amazing. In fact, we are starting to prefer to spend more time at home watching Netflix than going to the movies. The curved display ensures that we can set the monitor at exactly the right place for viewing with ease. The vibrant life-like images created through the monitor are so realistic that it seems all the drama is happening right here in our living room. All credit goes to the 1,000:1 contrast ratio, 10-bit color for 1.07 billion distinct hues and the 100% sRGB color gamut. The Turbo Key feature makes life even easier by allowing one to toggle the refresh rates without having to access the control panel. Switching between the 60Hz and 100Hz even in the middle of a captivating game is as simple as batting an eyelash. In all seriousness, ASUS has allowed me to get the smoothest game playing experience so far. It has made games so addictive that I can barely get myself to do anything else over the weekend. I am not very proud of that but I am certainly very proud of my new ASUS! Let’s face it, one of the biggest health dangers for us gamer is the risk of ruining our eyesight. 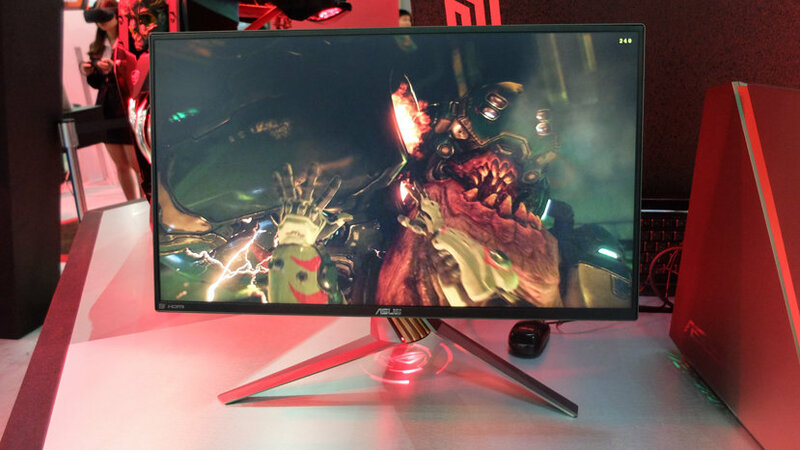 The good news is that ASUS ROG SWIFT PG348Q G-Sync monitor has been made keeping in mind serious gamers like us. I often take a sigh of relief (while keeping my eyes totally hooked to the screen) thinking how the ultra-low blue light must be protecting my eyes from the harmful and damaging blue light regular monitors emit. You can select the appropriate filter setting for yourself from the four options that are available. This is certainly a key feature for me as, despite my addiction to gaming, I do care quite a bit about my health and well-being. I also must mention that the monitor reduces flicker to minimize eyestrain during marathon gaming sessions. 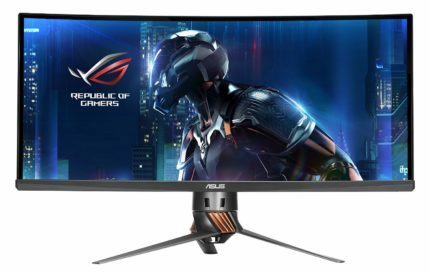 I must include in my ASUS ROG SWIFT PG348Q monitor review that this, in my opinion, is hands-down the best monitor for deeply embroiled marathon gaming sessions. If you like to spend the weekend doing nothing else other than playing your favorite games, then ASUS ROG SWIFT PG348Q gaming display and you are a match made in gamers’ heaven. The ergonomically-designed stand allows you to tilt, swivel and make height adjustments in a very easy manner. You don’t have to worry about neck and back strain while spending hours in front of the monitor because you can get it to face you the right way. Overheating can be a major issue during long gaming sessions. In fact, that was a major problem I faced with my old monitor. However, this certainly is the ‘coolest’ monitor quite literally. Since the fanless air vent system uses convection currents to generate ample airflow inside the monitor, the cooling process is super silent. There really is zero disturbance to the gaming session as the cooling process remains largely unnoticeable while your monitor stays super cool. This model also offers excellent connectivity. Display ports include HDMI port and DisplayPort 1.2 the mouse. You can also charge your phone by connecting to the ports. I have to admit that this is an excellent feature for me as I often forget to charge my phone. While in the midst of an intriguing game, I often realize how drained my phone’s battery is. This has made my life easier as I don’t have to move from my seat at all to charge my phone anymore. Choosing the best monitor was no easy decision, but I am really glad I decided to go with ASUS ROG SWIFT PG348Q IPS display. In the 6 months that I have owned it, I have not had any issues. The gaming experience is smooth and watching movies is a true delight. This has been a total win-win situation for me. 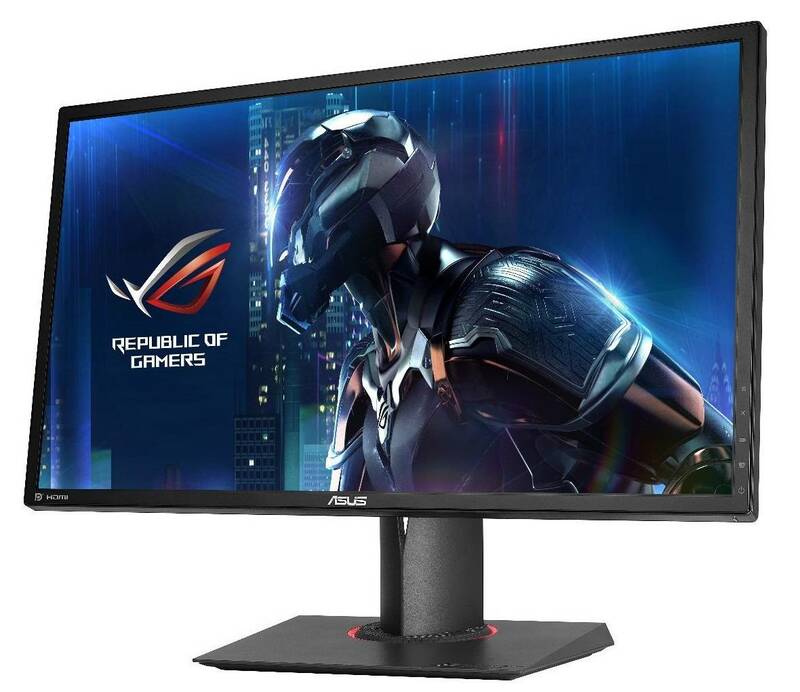 If you are looking for a high-performance monitor suitable for marathon gaming sessions, then ASUS ROG SWIFTPG348Q gaming monitor is certainly the right one for you. The viewing angle and the brightness retention are exceptional. The ergonomic design, ultra-low blue light, and flicker-free technology will allow you to experience comfortable and strain-free gaming sessions. I am really glad this has been an excellent purchase because I would have really hated to pack and send back this seriously giant monitor!